On Sunday evenings from 6:30pm – 7:15pm we pray Evening Prayer (Vespers) in the main chapel. All are welcome to join us for prayer and reflection with Our Lord . Please Note: Booklets are provided. 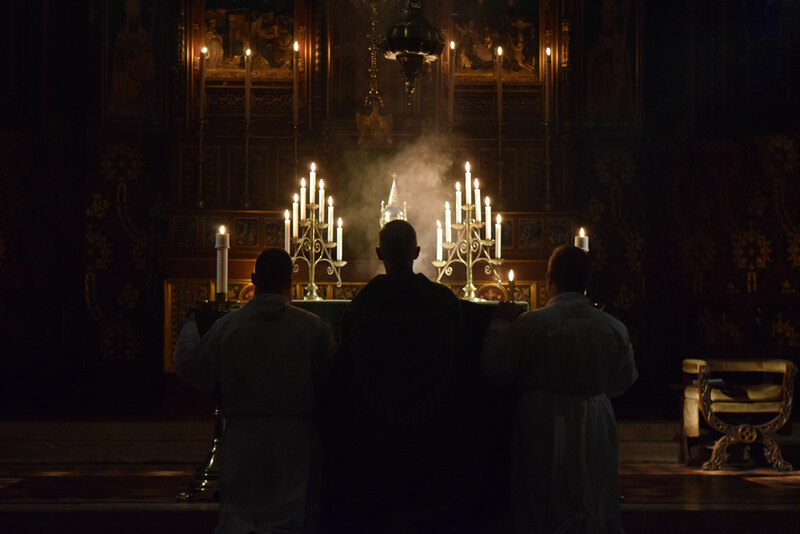 “From ancient times the Church has had the custom of celebrating each day the liturgy of the hours. In this way the Church fulfills the Lord’s precept to pray without ceasing, at once offering its praise to God the Father and interceding for the salvation of the world.” — Office of the Sacred Congregation for Divine Worship. Liturgy of the HoursThe Liturgy of the Hours is the prayer of the whole People of God. In it, Christ himself “continues his priestly work through his Church.” His members participate according to their own place in the Church and the circumstances of their lives. The laity, too, are encouraged to recite the divine office either with the priests, among themselves, or individually. The hymns and litanies of the Liturgy of the Hours integrate the prayer of the psalms into the age of the Church, expressing the symbolism of the time of day, the liturgical season, or the feast being celebrated. Moreover, the reading from the Word of God at each Hour with the subsequent responses or troparia and readings from the Fathers and spiritual masters at certain Hours, reveal the deeper meanings of the mystery being celebrated, assist in understanding the psalms, and help one prepare for silent prayer.